To understand why this is such a bad idea, first we have to define exactly what a carry rotation is, and more importantly what it isn’t. What is NOT a carry rotation is carrying specific guns for very specific purposes, or if you want to be all operator about it, mission profiles. I’ll use the three guns in this picture as an example. My “primary” is the Beretta 92D in a sweet Dark Star Gear holster. That’s the gun I wear the vast majority of the time these days. However, I also have a Beretta 85 Cheetah, and a Smith & Wesson 351PD that I featured in a recent YouTube video. The Cheetah, which is a 13 shot .380 is a gun I carry when I simply don’t want the bulk of the 92D. Usually this is because I’ll be in dress clothes, or an environment where a 3 pound DAO auto isn’t practical conceal. It shares similarity of controls and action type with the Beretta I carry for CCW and the Beretta I carry for the USAF, so it’s a sensible choice. Similarly, the J-frame is for a very specific set of circumstances; a 7-shot .22 Magnum that weighs less than my phone is a perfect choice for when I’m in running shorts or other extremely casual clothing. It also is much easier to deep conceal than any of the other guns that I carry on a regular basis. Now that we understand what a carry rotation isn’t, we can look at what a carry rotation is, and why it’s a bad idea. Note that with the three guns I carry regularly, they are all similar trigger types (DA/SA or DAO) and each gun is used for a particular set of circumstances. A carry rotation on the other hand is when you say “oh well it’s Sunday I’m going to carry the 1911 today, Monday I carry the Glock 19, Tuesday I carry the HK P30L, etc etc.” Choosing to carrying a different gun because it’s a different day of the week, or the moon is in retrograde, or because “I felt like it” is a pretty terrible idea and here are a few reasons why. First is a lack of consistent practice. 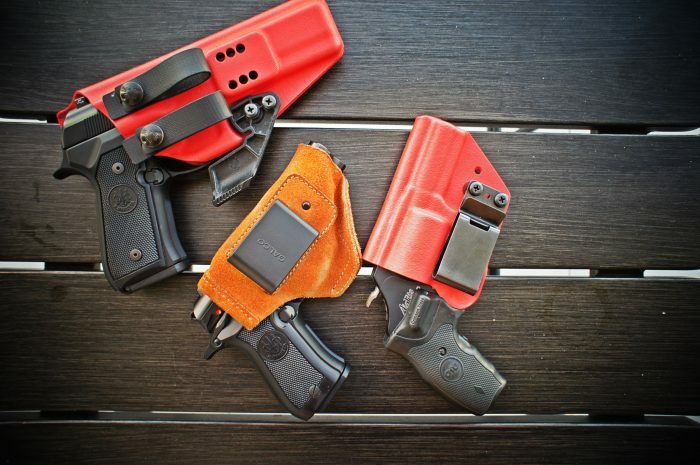 If you’re carrying four different guns with four different action types, how do you consistently practice? How do you adapt to the trigger going from a DA/SA to a striker fired to an SAO with a safety? The real answer of course is that you don’t. Sure, some people are at a high enough skill level that they can pick up basically any gun and shoot it pretty well, but it’s been my experience that the sort of people who have “carry rotations” aren’t those people. Second is the equipment issue! I already have a box that has 100 holsters in it, and at this point I don’t really want to have any more holsters laying around. I can’t imagine trying to have enough holsters to carry four different guns simply because it’s a different day of the week. It would get exhausting and expensive. Finally, there’s the issue with access. Let’s say sometimes you carry a 1911 in a traditional IWB holster behind the hip, but today you’re carrying a j-frame AIWB because it’s J-frame day or whatever. What happens if you actually need that gun? Are you going to be able to access it from a holster position you don’t practice with and manage a trigger you’re not used to? Like the 8-ball says…signs point to no. I get it though, guns are cool. Sometimes we want to show off guns and carry different things. However, I’d suggest that if the primary reason that you’re carrying a gun on a specific day is because you think that gun is cool…you might want to re-examine your priorities. Always like your sensible posts on using a tool properly. Excellent article. Like you, I have carry guns for EDC (Springfield XDs .45), “Serious Social Occasions” (Springfield XDm Compact .45) and “Always Gun” (Diamondback DB9). Each require practice and different draw techniques, but the choice is based on what threat/weather environment I’ll be in rather than a desire to carry the “cool” gun for the day. Sound reasoning. This is exactly why Old Slabsides became a safe queen when I got Glockified. I did not know that “carry rotation” was a thing, so thanks a for that. How about we regularly change up the type and locations of our fire extinguishers too? I once drove three different cars, in a “which one will I take to work today?” sort of deal, because I thought it was cool. Very quickly I then realized that I had a terrible time of it, for one thing because I never knew where my stuff was. It took only a few rotations before I started hating it. the only rotation I do is magazine/clip rotation to keep spring action proper. I think for certain lifestyles a “rotation” may be necessary, but wifey and I don’t do alot of diverse enough things to consider it.